Leviim – July 20th Updates! Hello friends and fam of Leviim 2017! Our week has been full of anticipation for Zimriyah, which will be taking place tonight. For those of you that don’t know, Zimriyah is a singing competition between the six aydot, with each aydah performing three songs. Our campers were co-champions last year, and thus have high expectations going into this years competition. Luckily Leviim is cool under pressure, and our campers have been preparing diligently all week, learning the songs, hand motions, harmonies, and more. Check out tCamp Yavneh’s Facebook page to catch the livestream, which should start around 6:30 PM tonight. I wanted to highlight something beautiful our campers did this week. Every session, each aydah completes a chesed project, some kind of project to help others. For our chesed project, we decided to write letters through the organization More Love Letters. The organization compiles requests for letters on their website. Then, complete strangers write heartfelt and genuine letters of love and support to these complete strangers who are suffering in life. So on Tuesday afternoon, that’s exactly what Leviim did. 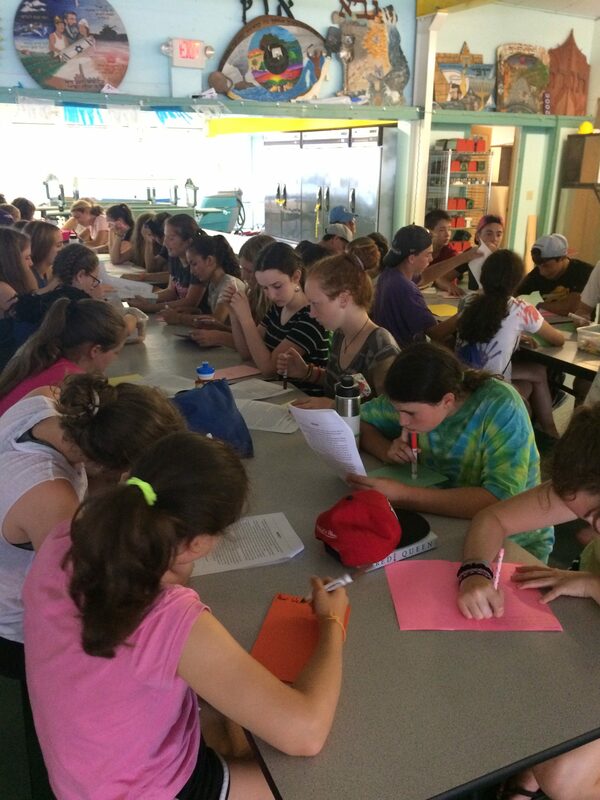 After learning a little about compassion and it’s value in Judaism, all of our campers wrote love letters. It was beyond uplifting to see this group of teenagers, who often can’t sit still for more than a minute, truly empathizing and caring about people they had never met. The letters are going to be sent any day now. You should all be happy to know how compassionate and caring this aydah is. I know I am. Unfortunately, first session is winding down. We’ve had an amazing few weeks and are looking forward to Zimriyah and our last Shabbat.